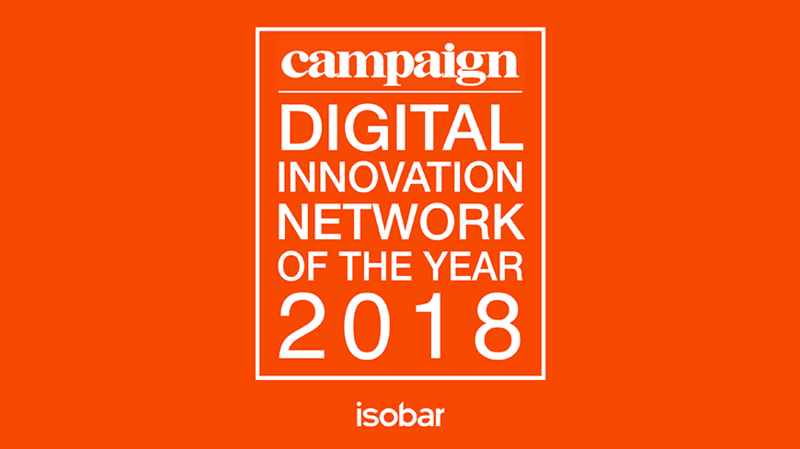 Isobar has won Digital Innovation Agency Network of the Year for the EMEA region at the Campaign Agency of the Year Awards. Campaign's ambition is to showcase what excellence looks like in the vibrant EMEA region, and Isobar is proud to be amongst a list of trailblazing winners. The judges praised Isobar's "Clarity of thinking and the creative approach," its "strong case studies, insight across industries and not innovation for gimmicky innovation's [sake]," and its "solid client portfolio [and] strong approach to digital." The awards were open to Agency Networks across the entire EMEA region (Europe, Middle East and Africa) and to qualify companies had to operate in 3 locations, with one office operating out of Europe. Isobar's submission included contributions from its 27 teams in the region. Jean Lin, Isobar Global CEO, "Isobar's submission demonstrated how experience-led transformation, innovation and collaboration has unlocked growth for the agency and our clients. It is a fantastic achievement by our entire agency and is a testament to how our ambition to be Experience Agency of Record is resonating within the industry." For the first time Campaign has sought to find the best agency networks and the best agency talent in Europe, the Middle East and Africa, as part of the expansion of their award schemes. Judges for the regional category included Matthew Barwell, the Chief Marketing officer of Britvic Soft Drinks, Nicola Mendelsohn Vice President of Facebook EMEA and Waithera Kabiru, Head of Media Futures and Digital at Diageo East Africa. Read the full write up in Campaign here.